Disclosure: I am partnering with Oral-B. All opinions are my own. Many people do not know that when I first graduated high school, I was dreaming of being a dental hygienist. Although my life took a different path, my passion for oral health is still strong. I love teeth, I love the dentist and to me, nothing beats that fresh from the dentist clean feeling. Well now, you can get that (and more) at home with the Oral-B Genius 8000! 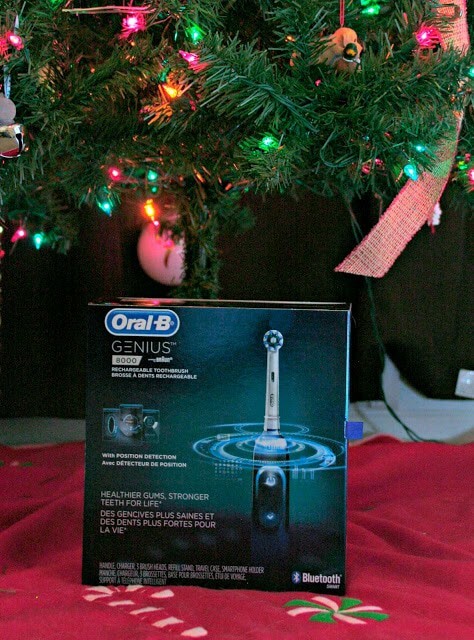 Also, check out the giveaway at the end of this post to win an Oral-B Genius! I have always used Oral-B toothbrushes for as long as I can remember. They are all that our dentists gives after visits, all that I stock up on between visits and once I even got into a silent auction bidding war over my first Oral-B electric toothbrush. I feel like Oral-B brushes are high quality, get a closer deep clean and that the technology that they are developing promotes amazing oral health. So when I heard about the Oral-B Genius 8000, I was very excited for it! 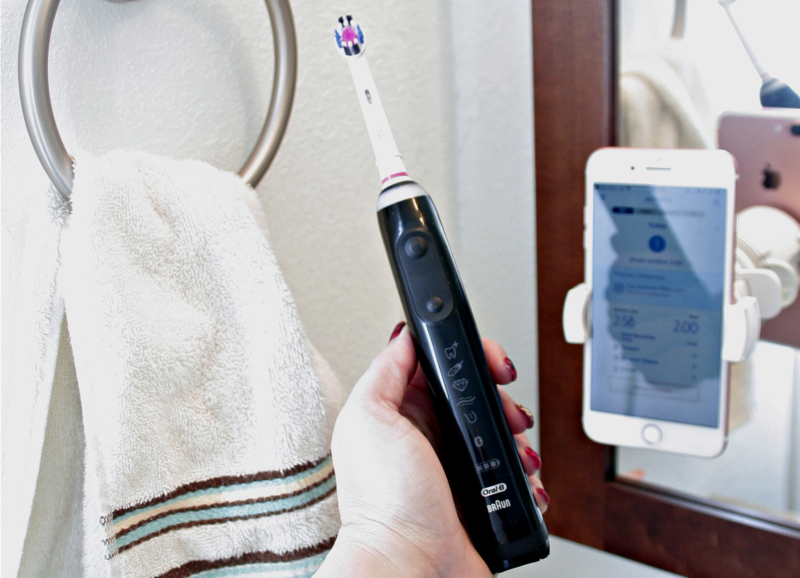 I just had to share the top 3 reasons that you need to get your hands on this toothbrush! The Oral-B Genius 8000 combines the rechargeable toothbrush that I love with a few new features that I am now obsessed with! First, is the ability for it to sync with your smartphone and share data with your dental team to help you get a much more thorough brushing. Second, is the stylish travel case that not only charges the toothbrush, but also your mobile device. Last, is the sleek, lightweight design that is so comfortable in my hand that I almost feel like it is effortless to brush. 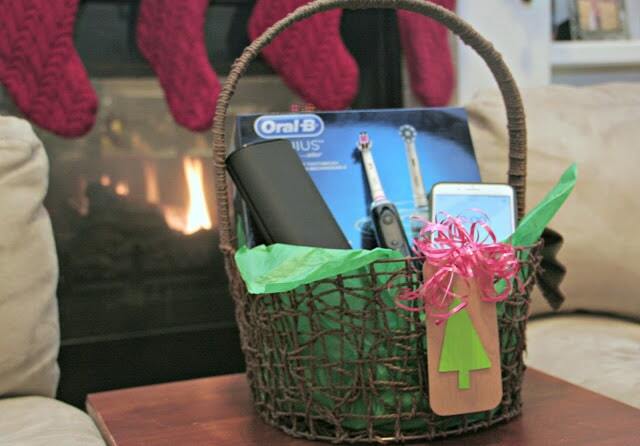 Since it is the holiday season, I decided to wrap up a little gift for the oral hygiene lover in me! I put together a simple basket, and for the purpose of this post, I only am showcasing the items in the Oral-B Genius 8000 packaging. However, if I were to gift this to another person, I would definitely add in some toothpaste and floss, a cute pair of pajamas and maybe a sleep mask. 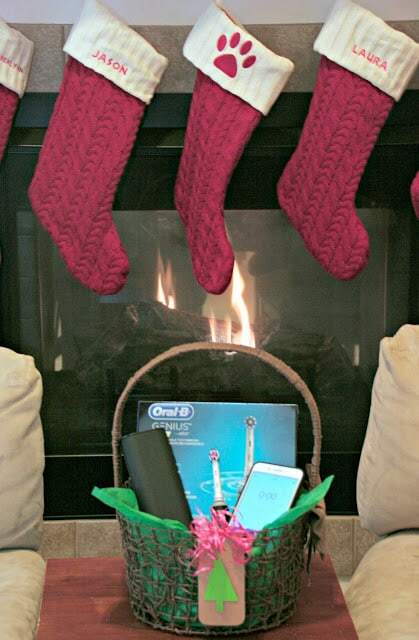 The Oral-B Genius 8000 is a great gift to wrap up this season. This holiday season, give the gift of practicality and health by upgrading your family and friends with this awesome Oral-B Genius 8000 toothbrush. Many people do not realize that when your teeth are unhealthy, your entire body is at risk. To me oral health is super important and if a toothbrush has the technology built in to show my kids how to brush better, allows them to challenge themselves in fun games and makes sure that they are getting all those hard to reach spots, I am all in! The technology in this toothbrush is amazing and truly sets it apart. I set the Oral-B Genius up on its charging station and downloaded the Oral-B app on my smartphone. 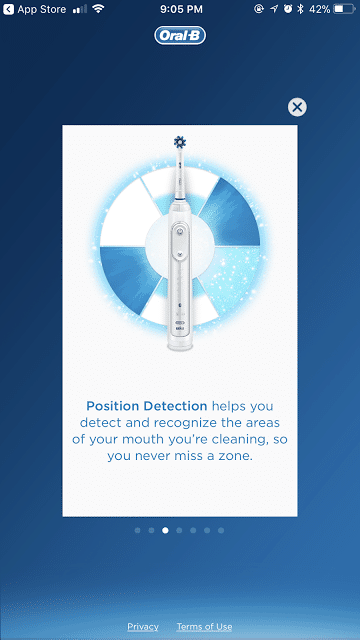 Easily synced the phone to the toothbrush and then was walked through the awesome Position Detection Technology as I brushed my teeth! It was like a game to see how well and how quickly I could clear each zone of my teeth. What I liked best though, was that once I finished brushing, my teeth had that “just had a dental cleaning” feeling. I also really liked that there was a timer to track how long it took me to brush all the zone of my teeth and this awesome feature called triple pressure control which insures that you brush as your dentist recommends with just the right pressure to avoid damage. 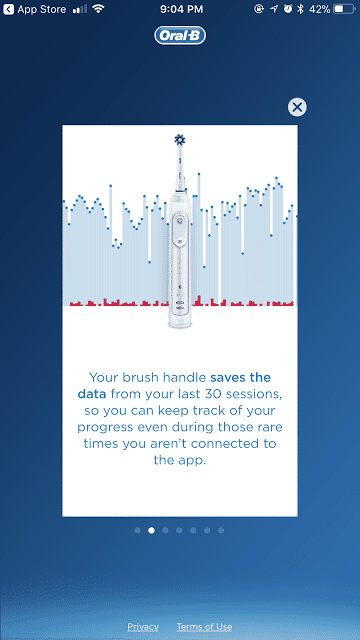 However, one of the coolest features is that your toothbrush actually stores your brushing data so that you can even share it with your dental team and they can input customized guidance to help you brush better and maintain a better oral health based on what they see during a check up and what the data from your toothbrush sessions shows! After just 4 sessions with the toothbrush, I have decided that I am definitely upgrading my family to these Oral-B Genius 8000 rechargeable toothbrushes. My 10-year old Oral-B electric toothbrush is still going strong and with that longevity, I feel like this is an investment that will actually save us money in the long run and help my family maintain good oral health. 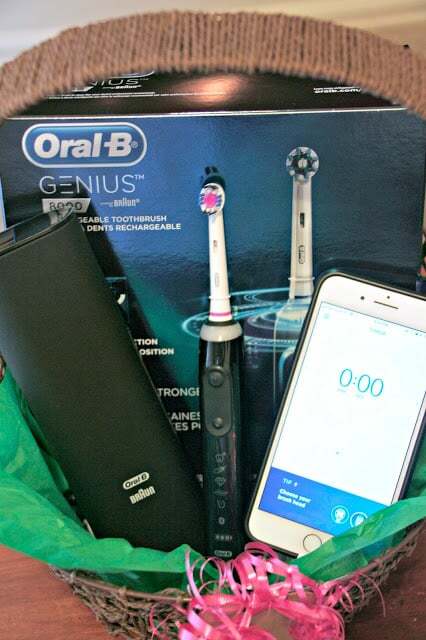 There is no better gift that you can give your friends and family then the gift of health and the Oral-B Genius 8000 is a great gift to accomplish that. I am so happy with my toothbrush and so excited to see my children’s brushing skills and habits evolve too. Give a gift that keeps giving this holiday season! Or better yet win one by entering the Rafflecopter below and leave a comment to the question below! What do you think about the Oral-B Genius 8000?